Siting in front of my hive one day, the hive at my parents house, I saw a bee stumble out of the hive and drop onto the ground. On the ground the bee continued to crawl on. I was surprised and concerned. I gathered up the bee to get a better look at it. There was clearly something wrong with it’s wings. It didn’t try to fly and fell to the ground when falling off of my hand. I had recently read about deformed wing virus (DWV) and that it could be an indication of a Varroa destructor infection as an opportunistic pathogen. After reading some more I was quit sure this was DWV. The wings were clearly deformed, not as bad as you can find on the interwebs, but you’ll see if you click on the image on the left it’s bad enough. It was right before the time I needed to treat the colony against varroa with formic acid so I was hoping that would take care of the problem. Other beekeepers I knew didn’t seem all that concerned so I reasoned that it wasn’t extraordinary. Still after my previous troubles, I wasn’t all that certain. Apparently the formic acid treatment was enough, I saw no more bees with DWV, the bees don’t last long after crawling out of the comb with this affliction so I guess no more bees with clear DWV were “born”. Without Varroa the bees can handle DWV fine but Varroa makes them more susceptible to any disease. 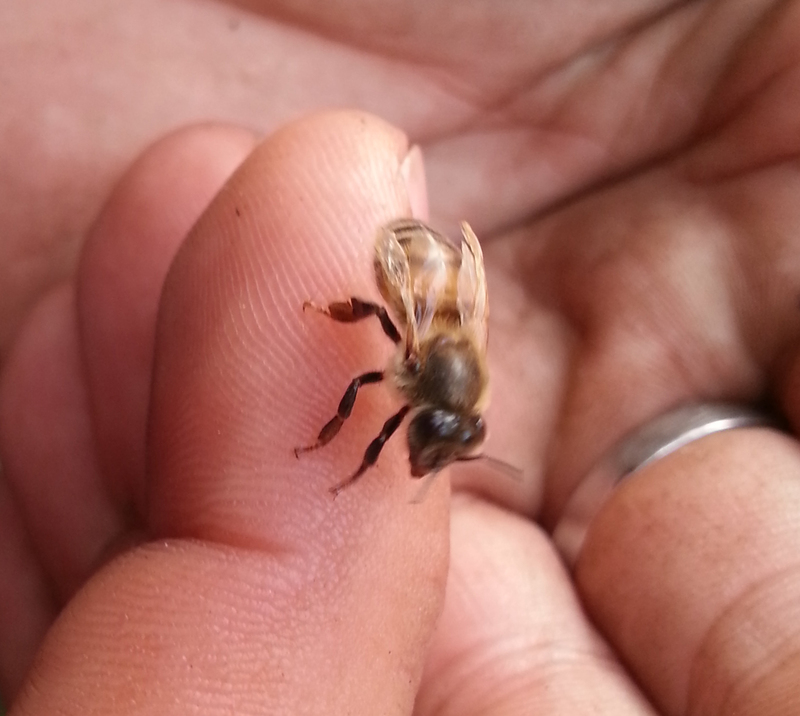 Varroa mites will often be carriers of DWV and in that way infect the bees. According to the Wikipedia article Varroa will serve as a kind of incubator for DWV and only colonies with a serious Varroa infestation suffer from it. I can only hope that the bees are relatively free of Varroa now and will make sure to treat them against Varroa next year so they stay or become healthy.